The University of Toledo is partnering with Ohio’s 13 other public universities to raise awareness of the value of public higher education and spur efforts to produce more college graduates to close the state’s higher education attainment gap. 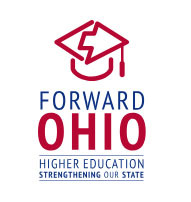 The statewide campaign, called Forward Ohio, seeks to mobilize public support for enhanced investment in public higher education and ensure that it is a public policy imperative for state government. Studies indicate that about 66 percent of jobs in Ohio in 2025 will require degree, certificate or other postsecondary workforce credentials. Currently, just 44 percent of working age Ohioans have these credentials. The Forward Ohio campaign illustrates how maintaining a strong system of public higher education is essential to closing the attainment gap and meeting the economic and workforce needs of the state’s business community. In addition to producing the workforce of the future, public universities also have direct economic impacts on their communities. In northwest Ohio, UT is the region’s second largest employer and has a $3.3 billion annual impact on the community. For every $1 invested by the state into UT, $10 of economic impact is generated to the local economy. UT also is an exceptional value for students providing a high-quality education with one of the lowest tuition rates among Ohio’s public universities. The value of a UT degree has been validated by external sources such as Schools.com, which ranked UT Ohio’s best four-year college when analyzing criteria such as affordability, flexibility and student services. The website LendEDU also ranked UT the top Ohio public college for the lowest student debt. Most recently, Student Loan Hero listed Toledo third in its list of the 20 cheapest cities in the country for college students, a ranking based on cost-of-living data in college towns where students benefit from low room and board costs on and off campus. Visit the Forward Ohio website at forwardohio.org for more detailed facts, figures and success stories. This entry was posted on Tuesday, May 15th, 2018 at 3:55 am and is filed under Advancement, Alumni, News, UToday .